Review of "Much Slower Than Light" a chapbook by Carolyn Clink including 3 complete poems in audio format. Canadian poet Carolyn Clink’s chapbook Much Slower Than Light is the focus of this week’s SF poetry review. Carolyn Clink is an accomplished poet who now lives in Mississauga (just west of Toronto) with her husband, science-fiction writer Robert J. Sawyer. She has many publishing credits to her name including poems in Analog, Weird Tales, Chiaroscuro, Tales of the Unanticipated, Space and Time, Star*Line, and Gaslight, and in the Canadian SF magazines TransVersions and On Spec. Her poetry has also appeared in many mainstream poetry venues. She is a sought after guest of honor at SF cons and has served as judge for contests and editor of several anthologies. She has published 3 collections of poetry. She has also discovered the time-sink that is beading. You can view some of her beading work here. Let’s see, half of these poems have been reprinted in a journal or anthology, some multiple times . First publications were in a variety of well-known genre magazines including Star*Line, Space and Time Magazine, On Spec, Weird Tales, and Gusts: Contempory Tanka. 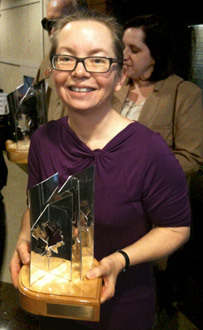 Two were finalists for the Aurora Award (Canada’s best Science Fiction and Fantasy) for best song or poem (“Stars” and “Zombie Bees of Winnipeg”) and one other was the winning poem in 2011 (“The ABC’s of the End of the World”). There are list poems (“10 Things to know about staplers” – Star*Line 34.1), Tanka, Haiku, Dwarf length and long(-ish) poems, free verse and rhyming verse, straight up SF, Horror, serious and funny/spoof poems and much in between. Clink’s style is very readable and highly enjoyable. All are easily understood and there’s nothing mysterious about most of them, but the depth in many sneak up on you. It’s difficult to get a handle on what makes these so special. It’s not so much the words themselves or the poetic lines, but the whole of the poem, which combines to light up your brain when the poem is over. Such that I was compelled to read each poem again immediately to try to fathom what had just happened. This is a fine example of what I mean.